Looking for cheaper alternatives instead of these pricey restaurants when in the city? Eat like a local and guzzle your way through national dishes like chicken rice, nasi lemak, laksa, satay and more at these alfresco eating spots in the CBD. 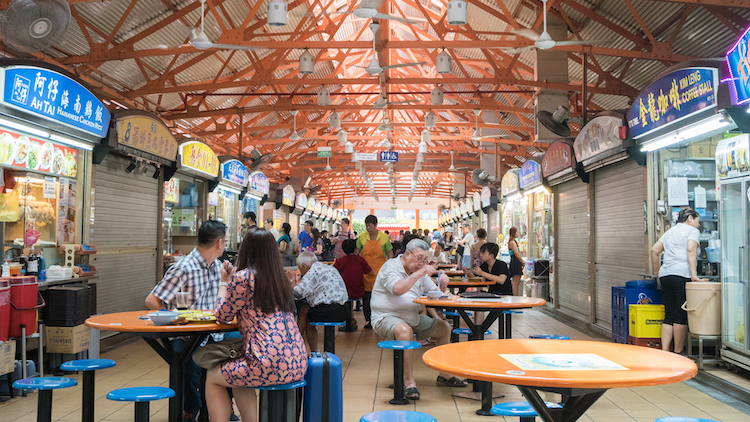 Championed by local food connoisseurs, these hawker centres in Telok Ayer, Chinatown, Amoy Street and Maxwell Road are sure to hit the spot. First known as Seng Poh Market, a one-storey refuge built by the government to house the street hawkers eking out a living in Singapore’s oldest public housing estate, Tiong Bahru Market is now a sprawling two-storey complex that retains much of its timeless appeal despite the surrounding landscape’s burgeoning ‘hip factor’. The ground floor is a hubbub of frenetic bargaining activity on most mornings, with over 250 wet market and retail stalls hawking anything from dried goods to ornamental fish and cheap clothes. But in stark contrast to the claustrophobic experience downstairs, pigging out at the upper deck’s food haven is a spacious, breezy affair. 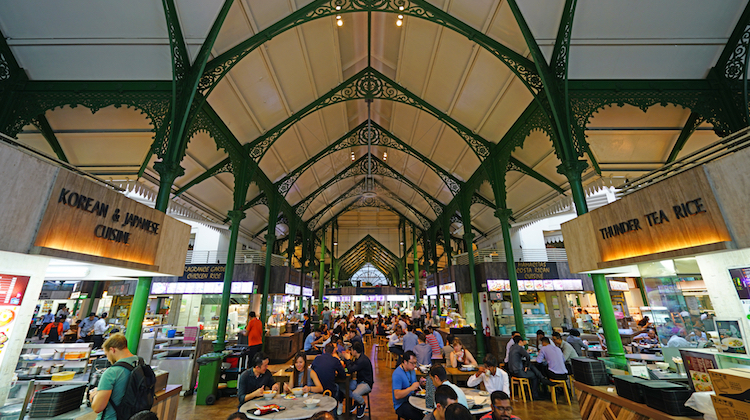 High ceilings, well-spaced-out tables and an alfresco area spell good news for even the fussiest of hawker centre eaters. TRY The chwee kueh from Jian Bo Shui Kueh is legendary and has endured for over 50 years despite the surfeit of similarly-named imposters masquerading as the real deal. This breakfast staple of oily rice cakes and fried chye poh is simple, sinful and addictive. Another institution down the same stretch of stalls is Tiong Bahru Pau, which has since expanded to six outlets island-wide. 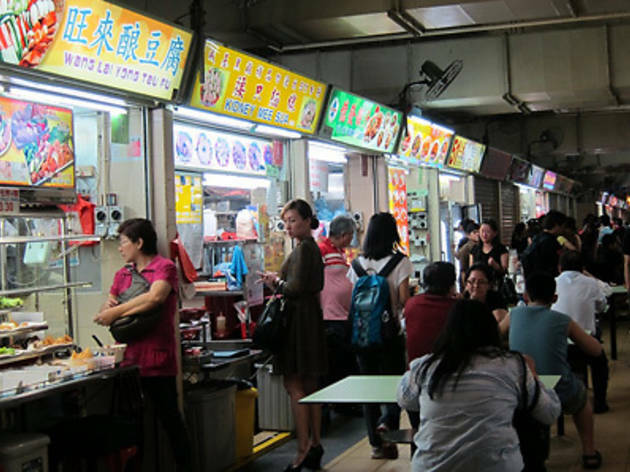 And a visit to TBM is never complete without the perennial debate over the two famous lor mee stalls vying for supremacy – both attract long queues and require a 20-minute wait on weekends. 178 Lor Mee is the new kid on the block that boasts pretty unusual ingredients while the more traditional take on this starchy noodle dish can be found at long-standing Tiong Bahru Lor Mee. BEST TIME TO VISIT Chwee kueh is the breakfast of choice for Singaporean champs so come down early and start your day right. 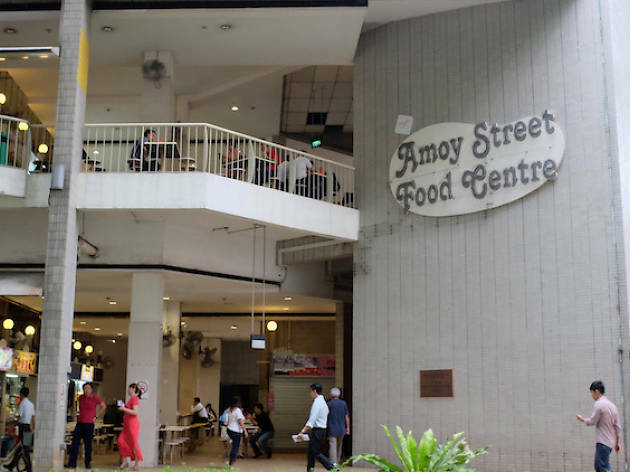 Whether you’re on a hunt on the city’s best street art or hungry for an assortment of noodle dishes, look no further than the two-storied Amoy Street Food Centre. It is decked with wall art that reflects its heritage, as well as a smorgasbord of hawker choices, from spicy Thai dishes and hearty congee to hearty plate of pasta and traditional nasi padang. For a caffeine fix, head upstairs to Coffee Break for a cup of flavoured lattes and mochas, in place of your regular kopi. During peak lunch hours (anytime between 11.30am and 1.30pm), queues are long and there’s nary a seat that isn't chope-d. At other times, however, it’s pretty much a ghost town, with few stalls even open during the evenings and weekends. 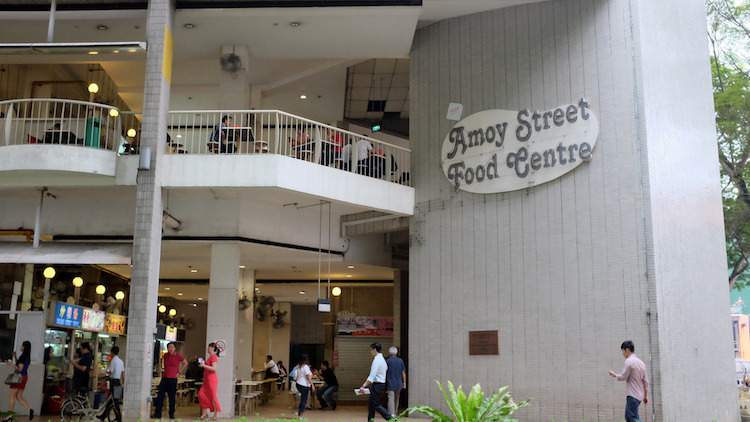 Given the assembly line queues, quality and service certainly aren’t the reasons for coming – the food can be inconsistent at stalls where food is cooked to order – but in terms of a range of options for a cheap lunch, Amoy can’t be beaten. TRY Michelin-approved A Noodle Story for a local spin on Japanese ramen. Skip the local dishes for a huge serving of pasta — think carbonara and aglio olio with the pasta and add-ons of your choice — at Chef B Western Delight. Authentic Thai’s menu includes a heat-o-meter to brace you for its spicy front. Go for the chicken basil rice if you’re brave enough. Han Kee Fish Soup is a top favourite with its generous servings of sliced fish in deliciously fragrant broth. Don’t walk out without curry puffs from the J2 Famous Crispy Curry Puff stall. BEST TIME TO VISIT Beat the lunch crowd by arriving around 11am. Most of the stalls should be ready for business by then and you won't have to fight for a table. 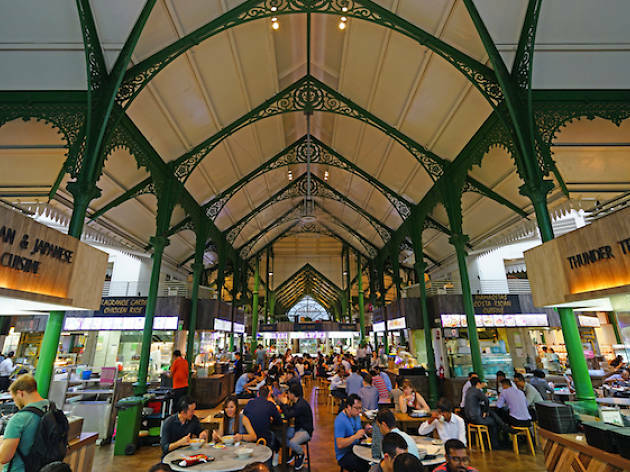 Home to a plethora of food stalls that champions different local fare – from flavourful Hainanese chicken rice and nasi lemak to wholesome porridge and mee pok – Maxwell Food Centre stands amongst the favourites for lunchtime nosh in the CBD. The chicken rice hype is real here: you can’t leave this hawker centre without ordering from Tian Tian Hainanese Chicken Rice where Michelin-starred heavyweight Gordon Ramsay and celebrity chef Anthony Bourdain were impressed with its take on the national dish. TRY Tian Tian Hainanese Chicken Rice’s signature dish — it’s blend of garlic and chili sauce goes well with the fragrant rice and deboned chicken smothered in light soy sauce. For something less intense, check out Zhen Zhen Porridge where its steaming hot bowls of chicken and fish porridge topped with ginger shreds will leave you satisfied for cheap. BEST TIME TO VISIT There are plenty of breakfast and lunch options here but avoid coming by in the evening. Most stalls close by 4pm. Originally an abattoir in the early 1900s at its initial site closer to Sungei Road, Tekka Centre in its present incarnation at the corner of Buffalo, Race Course and Serangoon Roads presents a far more appetising prospect. Now home to one of the best wet markets in town with a greater offering of halal-slaughtered meats than most, the pasar’s adjoining food centre has become a hawker institution offering great grub from a range of cuisines. 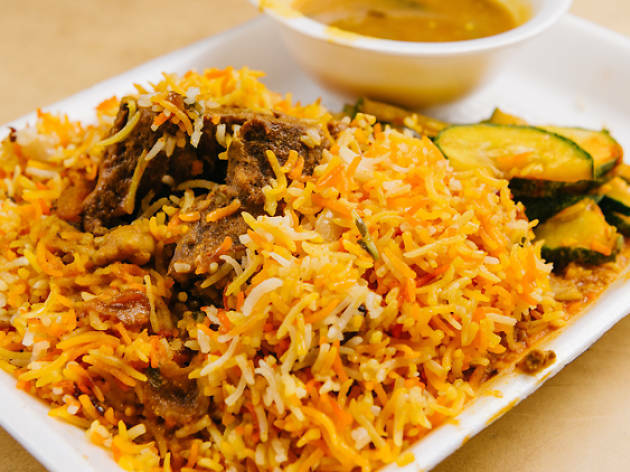 TRY Great things are always said about the biryani at Tekka Centre, and tangled in vicious rivalry are the plates offered by Yakader and Allauddin. Other good Indian cuisine options on offer include the very decent bowls of butter chicken best supped up with the crispy garlic naan at SJ Tandoori and the mixed plates of shrimp fritters, fishballs and potatoes drenched in a spicy thick orange sauce at Temasek Indian Rojak. BEST TIME TO VISIT When you feel hungry enough to order two plates of biryani to finally declare your favourite once and for all. What better way to try local food than in the heart of Chinatown? 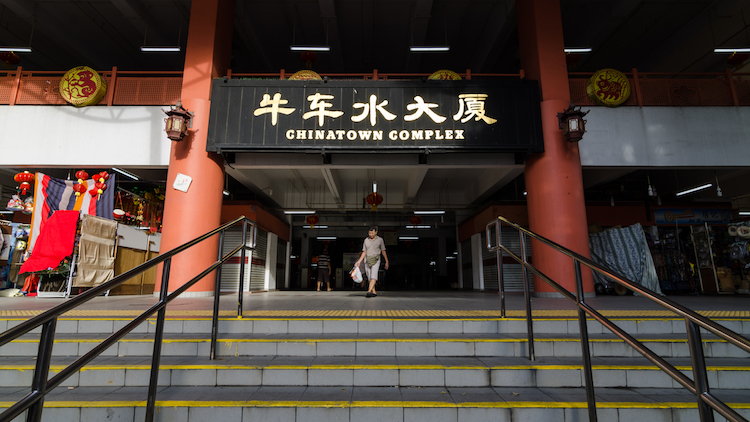 The Chinatown Complex Food Centre is fully loaded with all your favourite Singapore dishes at reasonable prices. 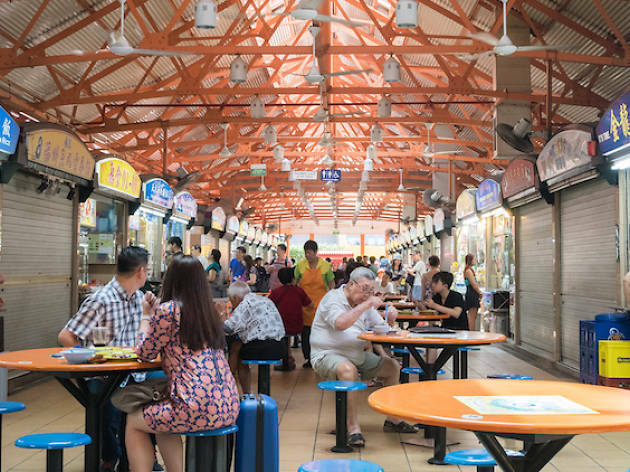 This massive hawker centre is also home to over 200 stalls, including local craft beer bar Smith Street Taps and the Michelin-starred Hong Kong Soya Sauce Chicken Rice and Noodle — impressive! TRY Without a doubt, Hong Kong Soya Sauce Chicken Rice and Noodle for signatures such as the soya sauce chicken rice or noodle, char siew rice or noodles, as well as roasted pork rice for less than $3 each — the cheapest Michelin meal you’ll ever get! For old-school claypot rice, look no further than Zhao Ji Claypot Rice – think chunky chicken pieces over piping hot aromatic, charred rice. 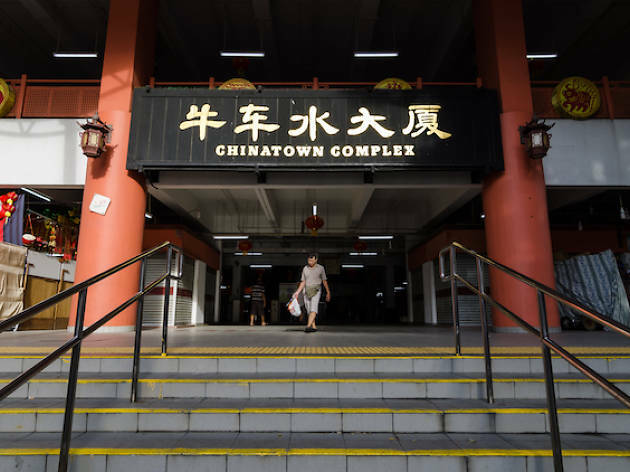 BEST TIME TO VISIT Chinatown Complex is a great all-day dining option. Pop by during lunch for yong tau foo and chicken rice or come during dinner for claypot rice and beer. You won't be out of options here. Yeah, it may be a little walk outside of Clementi's central area but a trip to Ayer Rajah Food Centre is well worth the effort, whether by foot or by bus. There are tons of Halal options at this hawker centre including ayam penyet, Indian rojak, mutton soup and mee goreng. 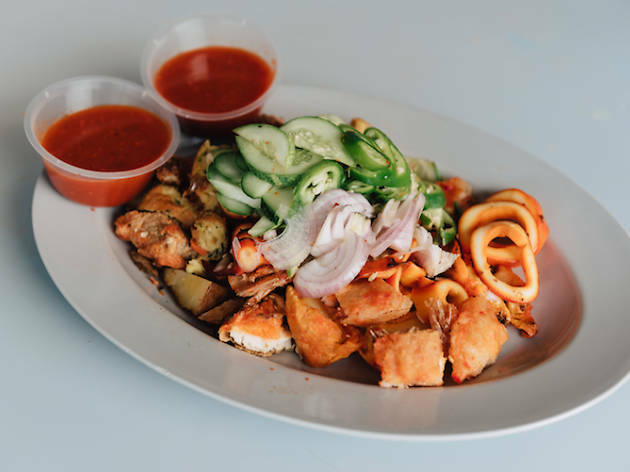 TRY We love Habib's Rojak, a second-generation Indian rojak store. Pick as many ingredients from the display case as you can manage and the stall owner will lightly fry them in a wok before serving them with a fab sweet dipping sauce. There's also Hong Kong Soy Sauce Chicken Rice and Noodles for fab dumpling and roast meats. BEST TIME TO VISIT Due to its location, this food centre isn't as packed as some of the others making it a safe bet to visit during lunch. 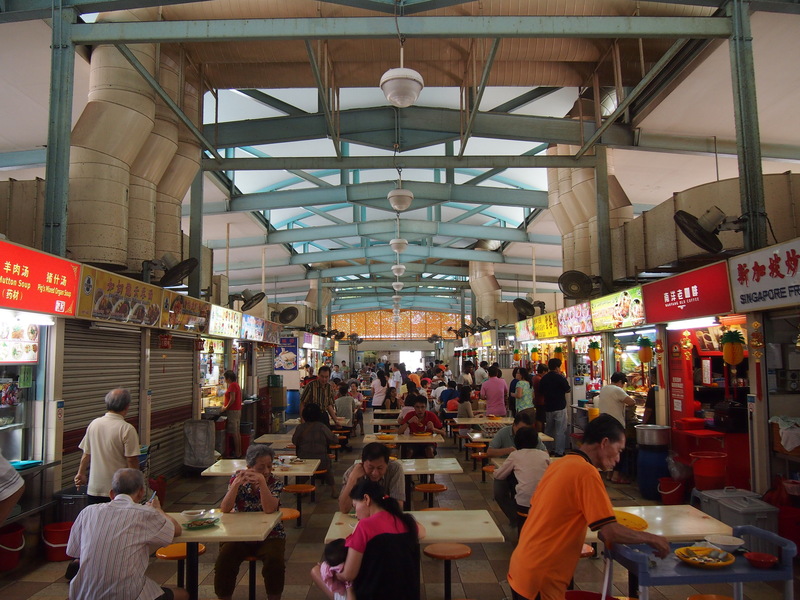 A hawker centre from yesteryear, has countless snaking lines at many of its acclaimed stalls – this is possibly the most renowned hawker centre on the island. But be prepared to brave the heat, there are three rows of back-to-back stalls built closely parallel to each other, so the steam and the heat from the stoves are trapped. Your best bet is to sit as close to the main road as possible for a breezy and comfortable meal. TRY Start with the soft, smooth handmade rice rolls from Freshly Made Chee Cheong Fun before moving on to Meng Kee Minced Meat Noodle & Foo Chow Fish Ball’s chewy pork-stuffed fishballs that hold tender, adequately fatty meat. Have these without the average noodles. Hold out, instead, for the thick yellow ones in a rust-coloured prawn-and-pork- rib broth – simmered at the Albert Street Prawn Noodles. Although the prawns are the headliners, it’s the tender, juicy pork ribs that are the real stars. Be sure to save space for Toa Payoh Rojak, Nam Sing Hokkien Fried Mee and Mattar Road Seafood Barbecue too. BEST TIME TO VISIT As previously mentioned, this place is hot so you're better off visiting in the evening for a satisfying dinner. 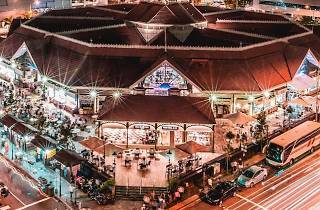 While locals usually turn their noses up at Lau Pa Sat due to its touristy nature, this historic building has its charms. 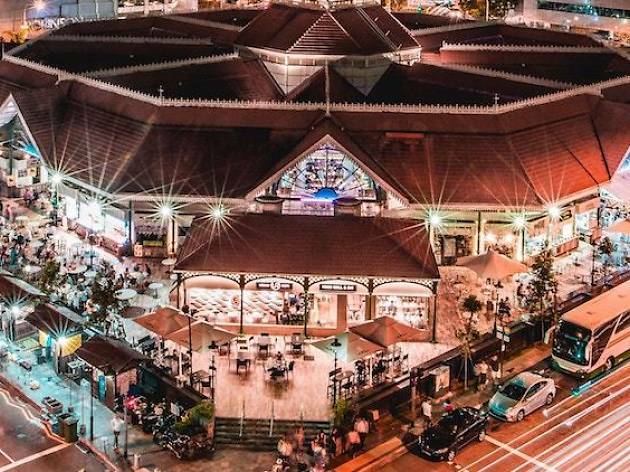 Aside from its stunning architecture, this hawker centre is loaded with scrumptious local food and international cuisine – providing tons of variety. Each stall is clearly labeled with the specialty it serves, from North Indian and Vietnamese to Costa Rican and Japanese. 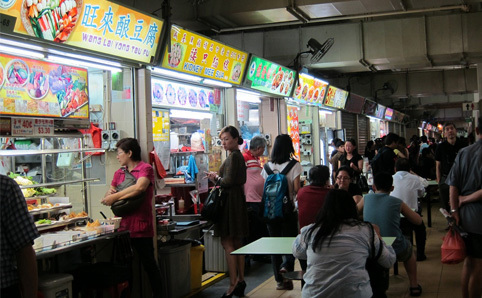 Come night-time, the Boon Tat Street side of Lau Pa Sat makes way for satay, the perfect spot for after-work nosh. 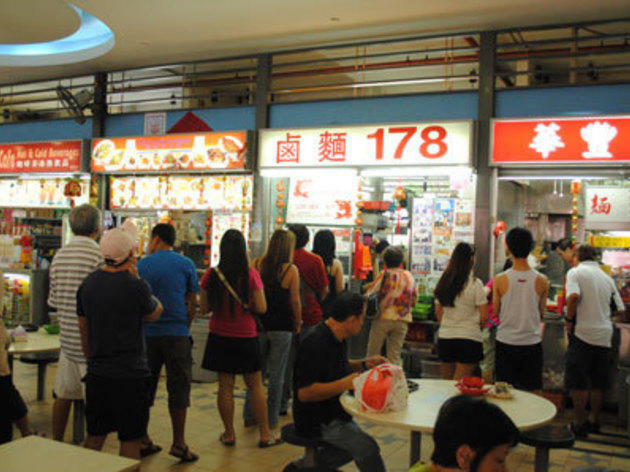 TRY There’s a reason why the queue stands long at Seng Kee Local Delights — customers swarm the stall for its hot-off-the-wok fried Hokkien prawn mee soaked in rich gravy for less than $5. Get a taste of Costa Rica with chicken or beef burrito, chicken or beef-filled chalupas, or arroz con mariscos or pollo at Mamacitas. For our Muslim friends, head over to Chicky Fun for halal Hainanese chicken rice, as well as authentic chicken char siew wanton noodles. BEST TIME TO VISIT Come after 7pm to gorge on satay, grilled sticks of marinated meats. Avoid coming by during lunch as the place is packed with people working in the CBD. 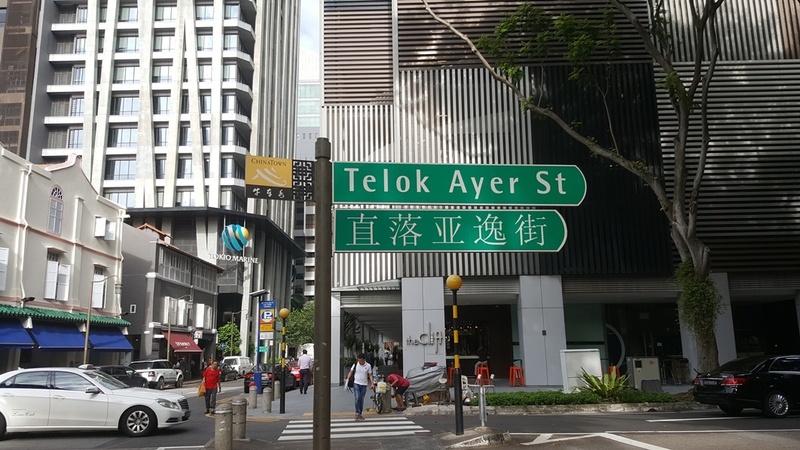 Conveniently located right next to Telok Ayer MRT station, Market Street Food Centre (previously known as Golden Shoe) has most of the stalls from its previous address at Raffles Place transferred to its new digs here. 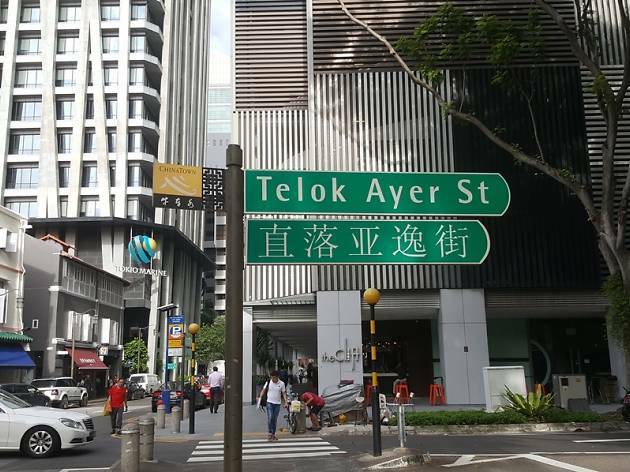 A short walk from the touristy hawker centre of Lau Pa Sat, this food spot has a cheaper variety — even a cup of hot teh tarik costs less than $1! Whether you’re craving for nasi lemak, hor fun, chicken biryani or fruit smoothies, you can easily find them here, under one roof. 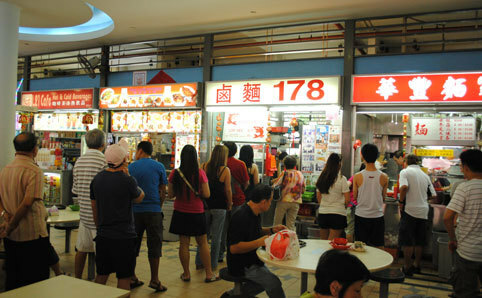 TRY Don’t give the Market Street Nasi Lemak a miss – there’s a reason behind its long, snake-like queue. If you’re in a hurry, try out Golden Nur’s crispy, fried chicken biryani. 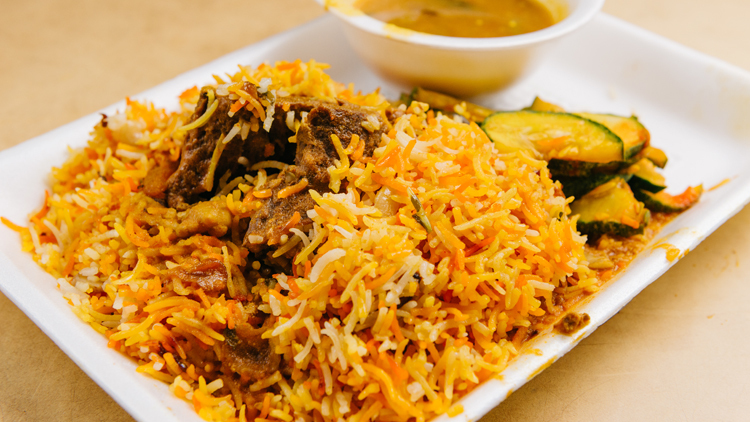 The queue moves fast and its signature rice dish is a must-try for any Indian food lover. Ah Liang Ipoh Hor Fun is a hot favourite for slippery-smooth rice noodles smothered in the stall’s flavoursome gravy, topped with the meat of your choice for less than $5. BEST TIME TO VISIT If you want to avoid the lunch crowd, come after 1.30pm. The queues are more manageable and you should be able to snag a seat from people rushing back to the office. Deep in the heartlands, Whampoa Drive Food Centre packs 80 stalls serving solid hawker staples, done fresh, well and cheap. It might be quite a trek to get to, but trust us when we say you'll be rewarded with the true taste of local cuisine. It's full of nostalgic finds that locals have been visiting for years, often made by hawkers that have watched them grow up. 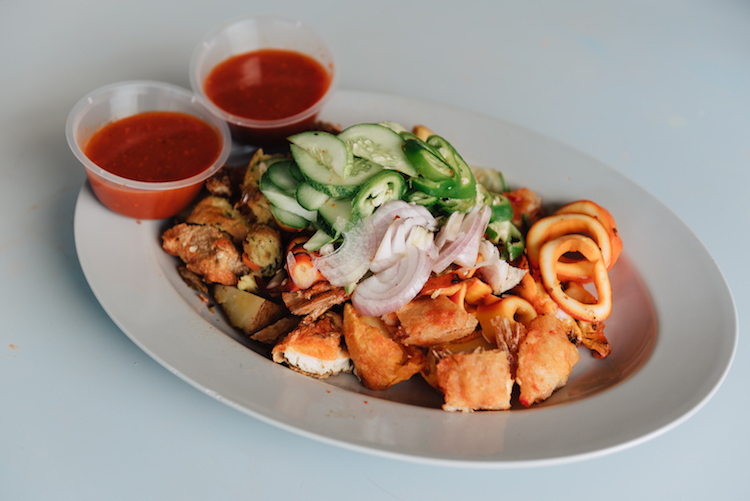 TRY Whampoa Drive has long been known for having the best Chinese rojak in Singapore, courtesy of Hoover Rojak, which dates back to the ’60s. The barbeque chicken wings from Whampoa Barbeque Seafood & Chicken Wing are another favourite at Whampoa. In addition to those two faves, there are plenty of solid hawker staples – try the satay bee hoon at Wham Poa Satay Bee Hoon or the dark carrot cake at Kim Kee Homemade Carrot Cake, fried up by a friendly hawker operator who’ll happily chat up a storm while you wait. For something different, Rabiah Muslim Food (#1- 34) notably offers a nasi Melayu selection including mutton curry, deep fried potato and sambel tempe tahu. BEST TIME TO VISIT While some stores open till the evening, you get the most variety when you visit while the sun's still up.